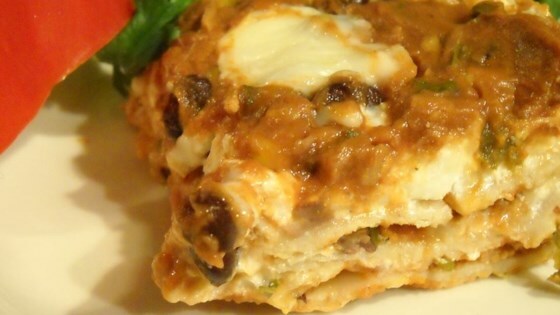 "Lasagna with a Southwest twist. This can be frozen unbaked and kept for up to a month. Simply thaw in refrigerator overnight and bake as directed. Tastes even better reheated the second day!" Coat a large skillet with non-stick cooking spray, and place over medium heat. Saute onion, red bell pepper, corn and garlic until tender. Stir in black beans, refried beans, tomato sauce, salsa and 1/4 cup cilantro. Cook until heated through and slightly thickened; set aside. In a large bowl, combine cottage cheese, ricotta, sour cream, shredded Monterey Jack cheese and remaining 1/4 cup chopped cilantro; set aside. Coat a 9x13 inch casserole dish with non-stick cooking spray. Arrange 3 of the cooked lasagna noodles in the bottom of the dish, cutting to fit if necessary. Spread with 1/3 of the bean mixture, then 1/3 of the cheese mixture. Repeat layers twice more. Cover, and bake in preheated oven for 45 minutes. Garnish with sliced black olives and sprigs of cilantro. Black beans, cream cheese, & green chiles give basic burrito’s a tasty makeover. This was not our favorite. I may try again, spice it up more and use flour tortillas instead of pasta. It's just something about Mexican and pasta that just doesn't mix with us.